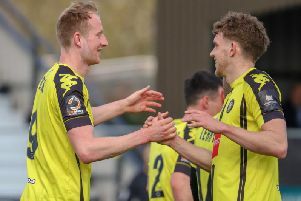 Harrogate Town had to settle for just a point from Saturday's home clash with all-but-relegated Maidstone United. Mark Beck moved Simon Weaver's team in front, but two stunning strikes by Justin Amaluzor turned the game on its head and, in the end, it took a penalty from Jack Muldoon to ensure that the hosts did not finish up empty-handed. And although they avoided defeat, the men from Wetherby Road have now taken just two points from the last possible 12 as their play-off bid begins to show signs of faltering. Maidstone came into the fixture on an awful run of form, though they were offered some encouragement by some sloppy Town play during the opening exchanges. Following a number of misplaced passes by the hosts, United raided down the right and Blair Turgott rolled a tame effort across the face of goal. 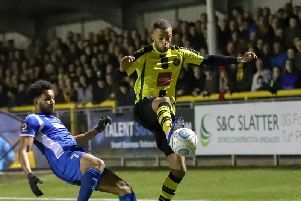 Harrogate eventually settled into something of a rhythm, however, enjoying a spell of prolonged possession that led to them taking a 21st-minute lead. Joe Leesley's corner was cleared initially, but the ball found its way back to the same player, who crossed from the left for Callum Howe to nod back across goal at the far post and find Beck, who could not miss. Town looked comfortable for the remainder of the half, Lloyd Kerry, Ryan Fallowfield and the returning Liam Agnew all firing wide of the target with strikes from outside the box. Beck then helped a Kerry effort into the back of the net from close range and although an offside flag cut short the home celebrations it seemed as if the men in yellow and black were heading into the interval in control of proceedings. That was until the ball broke kindly off Agnew into the path of Amaluzor 25 yards from goal for the visiting left-winger to level matters with a stunning shot into the top corner. The equaliser clearly lifted the Stones, who began the second period with greater intent, though gloveman Chris Lewington had to make a good save from Josh Falkingham's 49th-minute long-ranger. Moments later, Leesley was dispossessed inside the United half and the visitors countered swiftly, switching the ball to the left for Amaluzor, who raced into the box and beat James Belshaw with another excellent finish. Town didn't panic, however, and they got back on terms shortly after the hour-mark. Muldoon turned sharply inside the box, too quickly for his marker, who scythed the home side's top-scorer down. And it was Muldoon himself who took responsibility for the spot-kick, calmly sending Lewington the wrong way as he converted from 12 yards. That strike brought about another shift in momentum and Maidstone suddenly found themselves struggling to escape their own half. Muldoon was thwarted by a good Lewington block before Leesley cut in off the right and unleashed a beauty that kissed the top of the cross-bar as Weaver's side seemed to be building a head of steam. But that was as close as they were to come, the Kent outfit managing to restrict their hosts to just half-chances in the closing stages as the contest petered out into a draw. Town stay sixth in the National despite the result, though there is now just a three-point cushion between them and the other side of the play-off positions.